If you have an older home, it is possible that the wiring needs updated, and there is no better time to do it than during a renovation. It is one of the few times that accessing wires and fixtures through walls and ceilings is only moderately inconvenient. I mean, you were going to paint anyway, right? Here are some things to think about when considering electrical upgrades. Wiring: This is electrical basics. While it is getting rarer, there are still homes that are wired with old knob and tube setups that are unsafe and inefficient. This can be a major fire hazard that should be corrected regardless of renovation status, but during renovation is a perfect time to start. There are a few houses that have old aluminum wire, which should also be replaced. 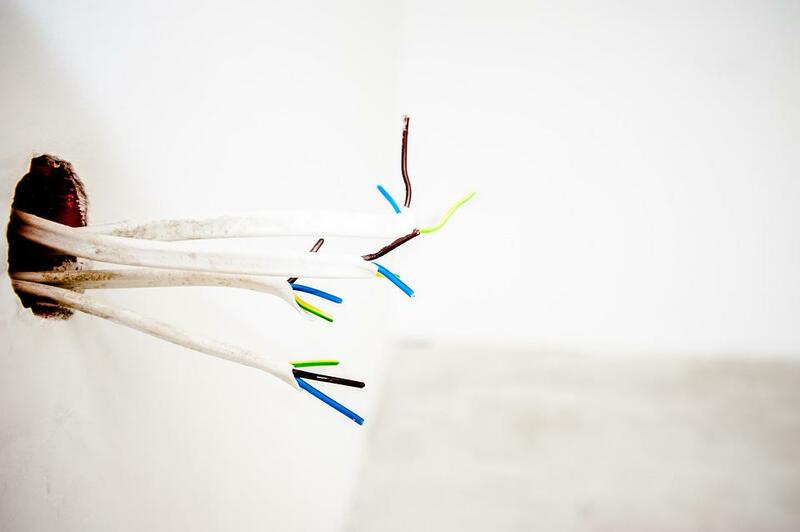 Old wires can have worn insulation, which is a fire hazard. If you are unsure of the wiring status in your house, an electrician should take a look. Warning signs of poor wiring or breaker box situations are tingling sensations when touching plugged-in appliances, flickering lights, and breakers that trip often. It is also possible that you are not getting enough power to your home, which can be corrected with new electrical panels, something that really should be handled by an electrician. Outlets: Did we mention that this is the perfect time to tear into the walls? There is rarely a house equipped with enough outlets in the places where they are needed. However, renovating gives a homeowner the freedom to fix their house the way they would have custom-built it. More outlets in the computer room, outlets behind the hanging television, and more outlets around kitchens and bathrooms are common requests. Additionally, new outlets can be high tech! Illuminate the hallway with led outlet covers. Put USB outlets next to traditional outlets. Make light switches glow when they are turned off. There is room for creativity here, and there are many options. Ground Fault Circuit Interrupters (GFCI’s): This is the most basic of safety measures in kitchens and bathrooms, but surprisingly, many homes still don’t have GFCI plug-ins near their sinks and baths. Again, this is something that can be done anytime outside of a renovation, and it is a simple fix, but renovations provide motivation for this type of a necessary upgrade. Repair Damages: Most homes come complete with at least one faulty light fixture or switch, and during renovation is a perfect time to fix the long-delayed fix-it project. ……AND NOW FOR THE FUN PART! 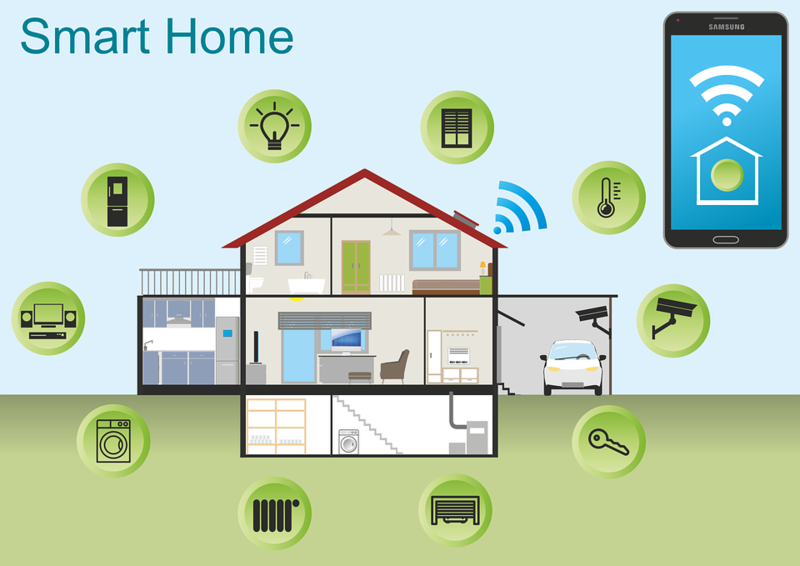 Smart homes are the latest trend in a never-ending road of innovation in society, and whether you fear big brother keeping his eye on you or not, many of these high-tech solutions are pretty amazing. Home Automation Systems: Ok. This is the top of the Smart home concept, and home automation systems control everything from lighting to climate control to security. The reason to install this during a renovation is that many of the smart fixtures and components of the system have to be permanently installed. Home automation systems are the apex of smart design, as they make the complete house accessible to those who have the smart devices. There are even smart video intercom systems. It’s very futuristic. Smart lighting solutions: LED lighting has created endless possibilities when it comes to lighting, and now it’s smart! Control lights from smartphones and dim or change their color. These lighting options may be compact, in regular led light bulbs, or they may be integrated into the home. Light strips are now available that can be place behind trim boards or furniture to create ambient light. Literally anything in the home can be lit. Sound systems: The final “smart” piece to consider when renovating your home is a speaker system. Speakers don’t have to be unsightly black rectangles hanging from the wall. They can be camouflaged into walls and ceilings. Not only is this more aesthetically pleasing, but it allows for better acoustics. Surround sound can actually surround a room. These speakers are also permanently installed, and renovation is a perfect time to do this because….you’re going to paint anyway! Bundling electrical upgrades with your renovation seems logical, smart, and cost-effective, so it is a great option for the homeowner who wishes for a complete update to their current home. Imagine walking into your early-20th century home and speaking commands to your home about what you want the temperature and the lighting to be. However, many renovations don’t include electrical upgrades, and some people don’t desire smart homes. Not including electrical upgrades is a misstep in your renovation plans regardless of how “smart” you want your home to be. Carefully considering the electrical situation in your home ensures that a renovation will serve its purpose: to completely overhaul a dated home or room in a home and make it the best it can be. This cannot be done without electrical.